You may order here on my website or on Teachers Pay Teachers. *This is a digital PDF download. No physical product will be shipped. Perfect to use in addition to my unit! ~Maria C.
Perfect for my little pilot! We are using it now and will be including it as part of an upcoming unit study on aviation at GypsyRoadSchool.blogspot.com. Great game! ~Holly J on History of Flight Game. 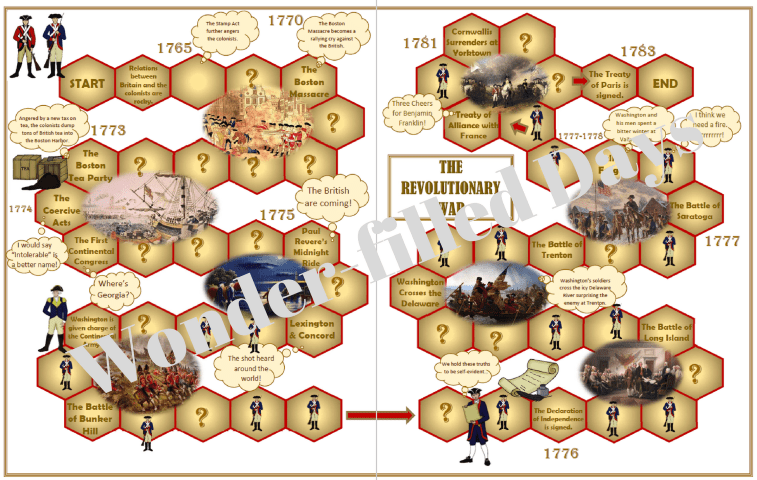 Use as a review after studying the related topic in your history curriculum. Use after a unit study on that topic. Use after reading the correlating I Survived Book by Lauren Tarshis. Check out a stack of related books from the library and then use the game as a review of what you’ve learned. 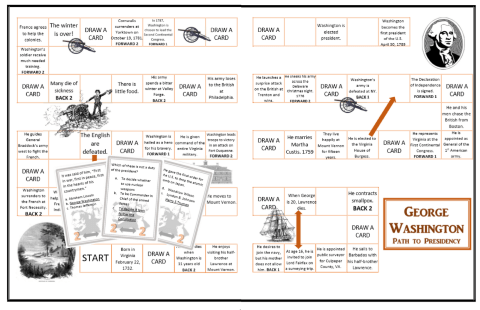 This is a board game to learn more about George Washington, the office of the presidency, and the lives of other presidents. 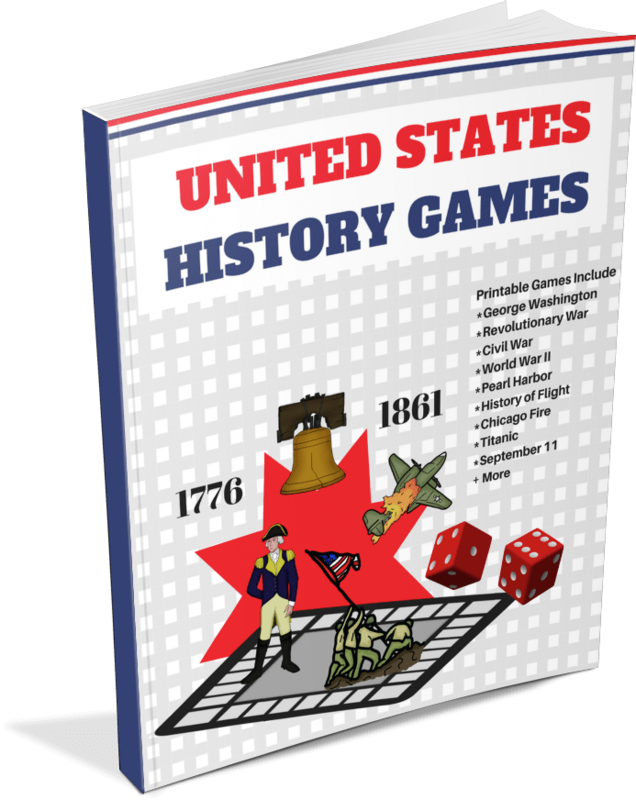 It includes a fun board game following the life of George Washington and forty-five question cards on the office of the president and on the lives of most of the United States presidents up to Donald Trump. The questions are multiple choice so all ages can play, but if your students find this too easy, have the students answer the questions without giving the choices first. Thirty-six question cards covering many of the important figures and events of the Revolution including George Washington, King George III, Thomas Jefferson, Benjamin Franklin, Thomas Paine, Benedict Arnold, Sibyl Ludington, Nathan Hale, Molly Pitcher, Paul Revere, John Adams, Henry Knox, Abigail Adams, etc. Instructions for two ways to play the game including a variation where players vote on the correct answer with letter cards. 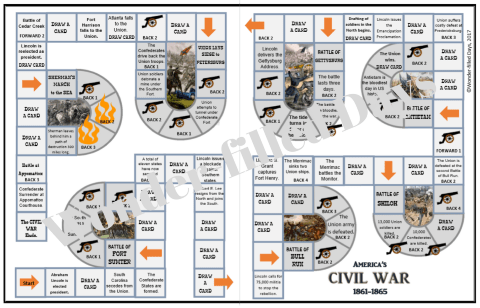 Sixty questions on the key events, figures, and battles of the Civil War. This game includes more questions than any of my other games because there was so much information I wanted to include. 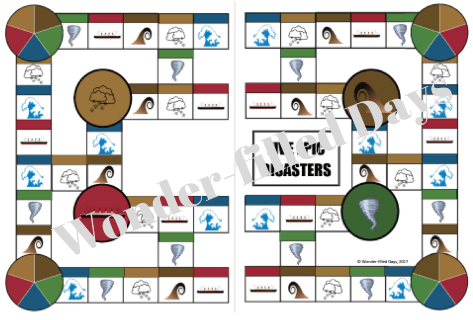 A four-page printable board. 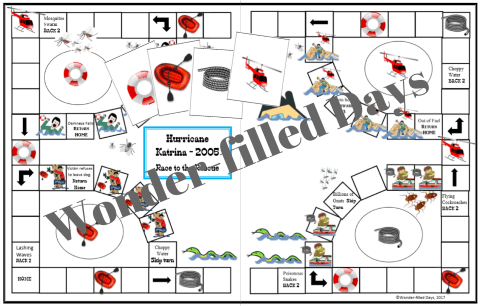 A low-color option of the board is also available. Goal: The goal of the game is to collect the most battle cards by the time you reach the end. 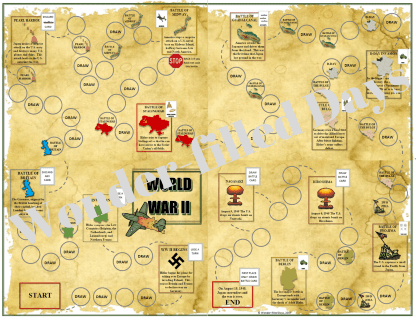 While playing, you will learn about the following battles: The Nazi Invasion, The Battle of Britain, Pearl Harbor, The Battle of Midway, The Battle of Stalingrad, The Battle of Guadalcanal, D-Day, The Battle of the Bulge, Iwo Jima, The Battle of Berlin, Hiroshima and Nagasaki. 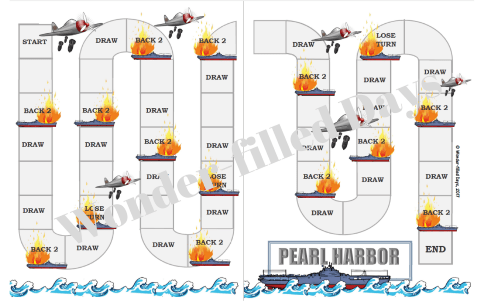 Thirty-six cards with facts about Pearl Harbor and America’s involvement in WWII. 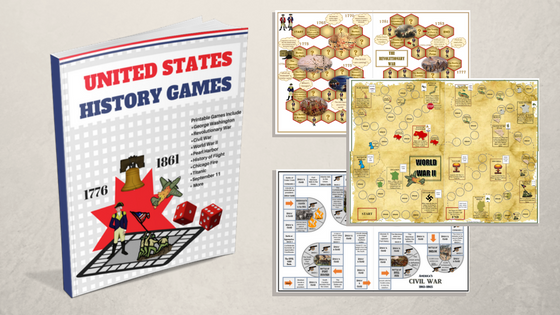 The cards cover the following subjects: Pearl Harbor, Japan’s Expansion, Axis and Allied Powers, Japanese Internment Camps in the United States, Battle of Midway, President Roosevelt’s “Day of Infamy” speech, Japan’s final surrender, and more! 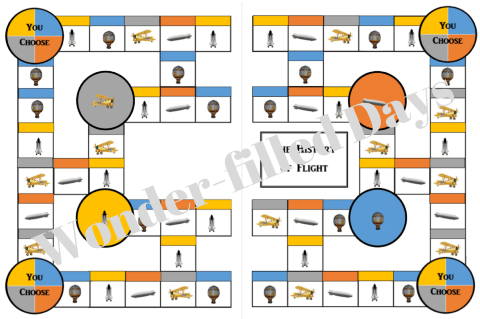 A printable board highlighting four main divisions of the history of human flight. The questions in this game are divided into four main categories. Each category has questions relating to “Who”, “When,” or “Why”. The Who and When questions are multiple choice. They Why questions are open-ended. The goal of the game is to collect sets of Who, When and Why questions. The questions include the following topics: Early Flight, Airships and Blimps, Airplanes, Space Travel. 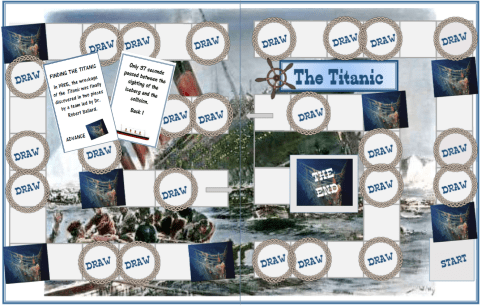 Thirty-six cards including ten “Finding the Titanic” cards that give details about the discovery of the Titanic. The other cards give facts about the Titanic and its sinking. 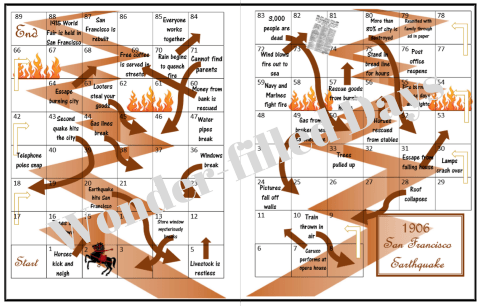 This is a simple “Chutes and Ladders” type of game. The questions in this game are divided into four main categories. The questions include the following topics: The Boston Molasses Flood, The Children’s Blizzard, The Titanic, The Henryville Tornado, and the Japanese Tsunami. 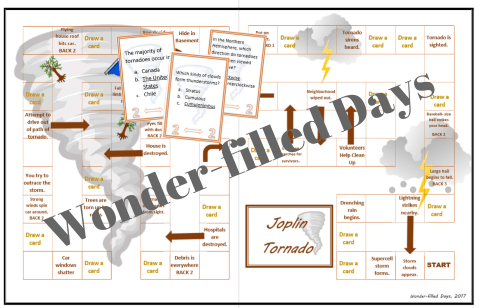 The game was made to correlate with Lauren Tarshis’ book I Survived: Five Epic Disasters and would make a great addition to the study of this book. 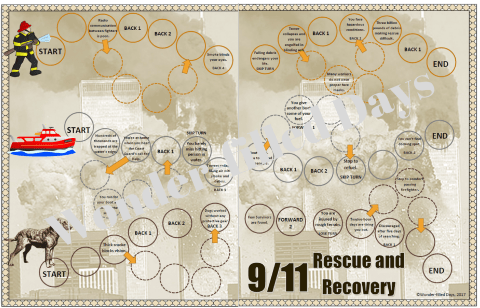 The game has three different paths which cover the following rescue efforts. 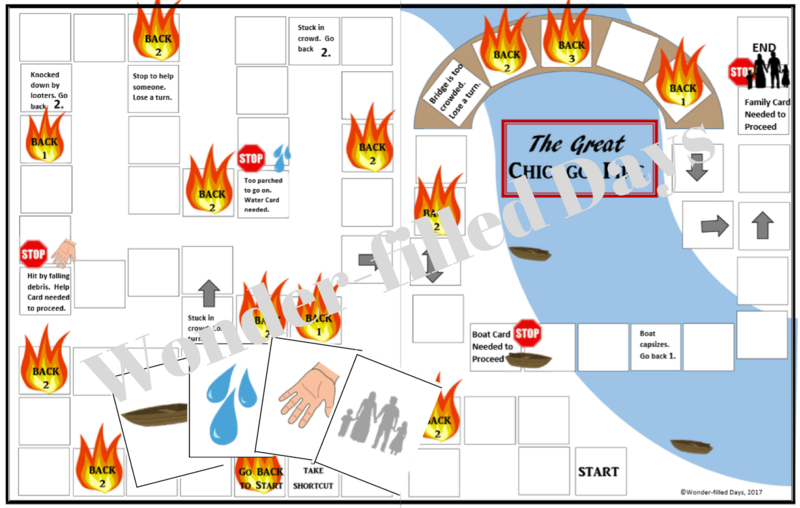 Most of my games work well with Lauren Tarshis’ I Survived series and can be used along with her books or on their own!